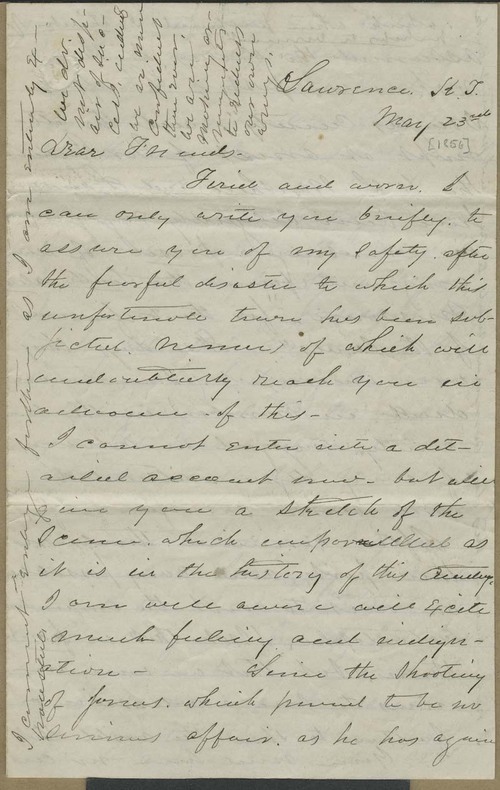 Written just two days after the sack of Lawrence, this letter contained Learnard's observations of and reflections on "the fearful disaster to which this unfortunate town has been subjected." The town's citizens, wrote Learnard, chose not to resist the authority of the U.S. marshal but were nevertheless brutalized by Sheriff Jones and a posse of Missourians. He also mentioned Governor Reeder, Governor Shannon and David R. Atchison, who "made a speech." People - Notable People - Jones, Samuel J.